NASA's robotic Opportunity rover snapped a picture of a vast, sandy plain and high-flying clouds while exploring Mars' Victoria Crater last October. 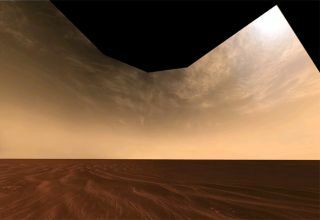 Clouds ofwater ice drifting above the Martian surface eat up some of the ozone in Mars?atmosphere, a new study suggests, giving scientists new clues about thechemical environment and climate of Earth?s nearest neighbor. Mars has arelatively stable atmosphere that is 95 percent carbon dioxide (Earth'satmosphere is only 0.04 percent carbon dioxide). Scientistshave had a difficult time modeling certain aspects of Mars' atmosphere and somesuspected that reactions between atmospheric gases and ice cloud particlescould account for the differences between their models and satelliteobservations, particularly of ozone concentrations. Water iceclouds high in Earth's atmosphere are key factors in the loss of ozone abovethe poles and may perturb the chemistry in layers of air below. Likewise, somescientists thought, similarclouds on Mars could be affecting ozone levels in Mars' atmosphere. Franck Lef?vreof the Universit? Pierre et Marie Curie in Paris and his colleagues used newozone observations from the European Space Agency's Mars Express satellite,which has been orbiting the red planet since 2003, to test the theory. Theirresults are detailed in the Aug. 21 issue of the journal Nature. They includedreactions of ozone with destructive chemicals called hydrogen radicals on thewater ice clouds, which ironed out some of the inconsistencies observed in themodels. Hydrogenradicals are also important to the recycling of carbon dioxide in the Martianatmosphere, making ozone a sensitive tracer to the chemistry of the atmosphereof Mars. Subsurfacewater ice was confirmedto exist in the arctic regions of Mars by NASA's Phoenix Mars Lander onJuly 31.